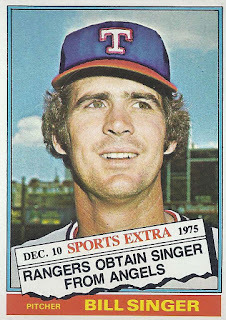 Texas Rangers Cards: 1976 Topps - Bill Singer. Bill Singer and his airbrushed cap appear here on card 411T of the 1976 Topps set. The airbrushed cap is symbolic of Singer's time with Texas. As the front of the card indicates, the Rangers got Singer from the Angels in a December 10, 1975 trade. Jim Spencer and cash went to the Halos in return. When Singer was healthy he was effective for the most part but he had a reputation as an injury prone player. From 1970 to 1975 he had suffered major physical setbacks in 1970, 1971, 1972, 1974, and 1975. He remained healthy in 1973 and made the All-Star team. Singer's goal for 1976 was to end the comebacks and stay for awhile. Singer appeared in ten games for Texas in 1976, all starts. He posted a 4-1 record while compiling a 3.48 ERA and 1.284 WHIP. He struck out 34 while walking 27. Bill seemed to be doing well for the Rangers. However, the WHIP, walks, and injury history were all concerns. That meant Singer was expendable. On June 1, 1976 Texas sent Bill, Jim Gideon, Mike Cubbage, Roy Smalley, and cash to the Twins in exchange for Bert Blyleven and Danny Thompson. Apparently Bill wouldn't need much more than an airbrushed cap to cover his time in Texas. I always noted that Singer got the airbrushed treatment in back-to-back years as he's airbrushed into a Blue Jays cap in '77. Guess that happened to a lot of players then though.